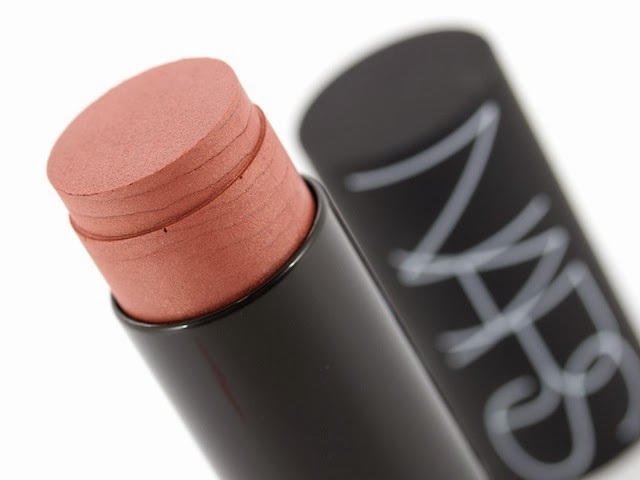 Part of the NARS Spring 2014 collection, the Nā Pali Coast Multiple is the latest version of François Nars' iconic innovation, the original - and indispensable - multi-purpose stick for eyes, cheeks, lips and body. This one has an insanely pretty colour and finish, and while NARS described Nā Pali Coast as a "shimmering rose peach" to my eye (and on my lighter olive skin) it's a little more like a beige-y coral with a super flattering satin finish. It definitely warms up my complexion in a totally natural way, looking almost like a light healthy flush when applied sparingly. The brilliance of the Multiple is that it can be used anywhere on the face and applied with fingers or brushes, blended every which way, layered and or sheered. I tend to use these sticks to the very last drop, and Nā Pali Coast looks like it's going to be another much beloved - and bought again - item. The unique creamy formula and sheer colour of all the Multiples blends effortlessly to create shimmering accents, clever contours or dynamic highlights on all skin tones. I find it’s best applied with fingertips along the cheekbone and blended with a tapping or smoothing motion. You can dust powder blush over for extra long wear or increased depth of colour, but thus far I love Nā Pali Coast all on its own. Just beautiful! This baby is available instore and online this Monday at Mecca Cosmetica.